Once upon a time, in Austerity Britain towards the end of a rather tough year, in a forgotten land called Salford far, far away in the North-West of England, there stood at the water’s edge, an imposing steel-clad theatre built at great cost when “times were better”. One cold and wintry December day, with frost on the ground and gloom in the air as a triple-dip recession was looming, hundreds of people gathered outside the doors of this mighty theatre, ready to escape from the cold and the news, for a few hours at least, and eager to be entertained in a warmer climate. Suddenly, a tall, dark man in a red hat appeared in front of the great big shiny doors and shouted “Open Sesame”, and the people gazed in awe, as the steely theatre opened its doors and ushered them in to the cavernous theatre and safe from the cold, cold icy fingers of the chilly climate. From the bleak and grey Salford streets, they scuttled inwards to take up their seats ready to be transported to warmer and more fruitful shores. All cosy, within the tented walls of an Arabian souk, they marvelled at the electrifying scenes before them. Whilst my short opening might be a rather humdrum little tale, the same cannot be said of the wonderful, ancient, and poetic folk stories that make up The Arabian Nights, a compendium of tales passed down through the ages. Tales that include many well-known characters such as Aladdin, Sinbad the Sailor, Ali-Baba and the Forty Thieves and many more, seven of which have been adapted by Dominic Cooke and directed by Amy Leach for this rather clever Christmas performance by the Library Theatre, in its temporary abode at The Lowry. The storyteller in this captivating performance is a clever young girl called Shahrazad, played with grace and eloquence by Rokhsaneh Ghawam-Shahidi, who longing to be free from the tyranny of a vengeful king brings to life the magical (if somewhat brutal) stories of One Thousand and One Nights in the hope that somehow the stories will set her free. Stories have the power to set us free in many ways, if only for a while (two and a half hours in this case), and enable us to imagine, laugh, wonder, ponder and to be enthralled by such rich and detailed tales of old. For this production, the Quays theatre is transformed into a round, souk-style bazaar, and there is plenty, on which the eyes and ears can feast. The set is dazzlingly oriental, and from the hand painted mosaic floor to the hanging-jewel-like-lanterns, it glistens, glitters, and is alive with colour and interest. This is a long, lively, and well thought out creation, which includes a choice of stories that complement each other well, presenting the audience with fun and frolics, danger and death, humour and honour all delivered by an accomplished cast using an array of styles. There is theatre, farce, slapstick, grief, and gruesome violence to entertain all ages and desires. Using very little in the way of technical or digital special effects, the cast work hard using traditional methods and good old honest props, acrobatic manoeuvres, and mimicry in order to create amazingly simple yet stunning theatrical effects and reconstructions from what must be a very big dressing-up-box. They re-create flying carpets by shaking shimmering sheets of satin, large flying birds from feather and fabric, and improvise in a variety of roles and outfits, and even create their own sound effects, howling, barking, and farting. According to the Arabian storyteller, it was Abu Hassan, who created the longest and noisiest fart ever – which they re-enacted, and which brought howls of laughter from the audience. It is hard to choose a standout performance as the talented and energetic cast all work relentlessly hard as one story follows another. They take on an assortment of different characters, with many outfit changes and lots of lines in various voices to recite and recall from the fabulous tales of the Arabian Nights. A small cast of nine, act in just short of a hundred different roles in the many different and beautifully recited tales. An added bonus in this meticulously narrated production is the musical accompaniment from the clarinet player, Arun Ghosh, who creates the beautiful and evocative sounds of a faraway Arabian land and seamlessly weaves his way in and out of the complexity of each separate story. There wasn’t an empty seat in the house, it was packed with people of all ages, from toddlers to grannies, and up in the rafters it was as hot as the desert setting (well, almost). Given that this production is around two and a half hours long of almost non-stop storytelling, I did wonder how the adults managed to pacify so many usually fidgety children, and could only conclude that their silence was due to the interesting content of each tale and the storyteller’s ability to enthral them and capture their imagination. There was good and evil, sorcery and trickery, villains and heroes, princes and princesses, fighting, squabbling and silliness all served up with the blood and guts of several sliced and quartered bodies. There was also the mean sultan and the threat of a beheading hanging over the storyteller Shahrazad, if she failed to entertain. Ever since time began, we have been telling stories to our children and there is something magical about sitting and listening as words create wondrous images, as great tales are woven and unfolded. When the tales are enhanced by a theatrical performance as good as this, it is hardly surprising there was little fidgeting and maximum concentration. Storytelling is an art form, often overlooked in these days of high technology, where visual wonders can be easily created on screen. 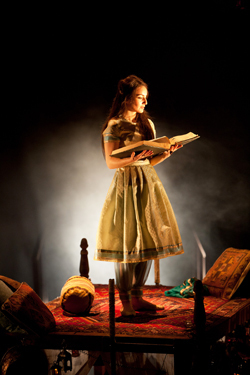 But, good stories never fail to entertain, so hats off to the Library Theatre for re-visiting such wonderful 12th century tales and adapting them for a new generation. 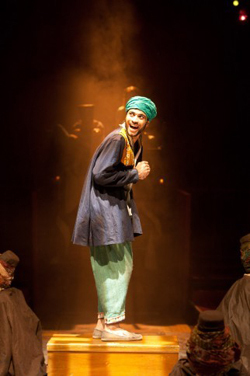 Arabian Nights: Friday 30 November 2012 - Saturday 12 January 2013.